Hi, Good Morning. Thank you friends and viewers. Today I will post how to make South Indian Rasam Recipe. Rasam is the best South Indian delicacy. In fact, an age-old belief is that one's cooking skills can be testified by the quality of Rasam (as it is called in South India) or Charu (in Telugu) or broth (a concoction of a few spicy ingredients) he/she makes. To a large measure, it is true also. 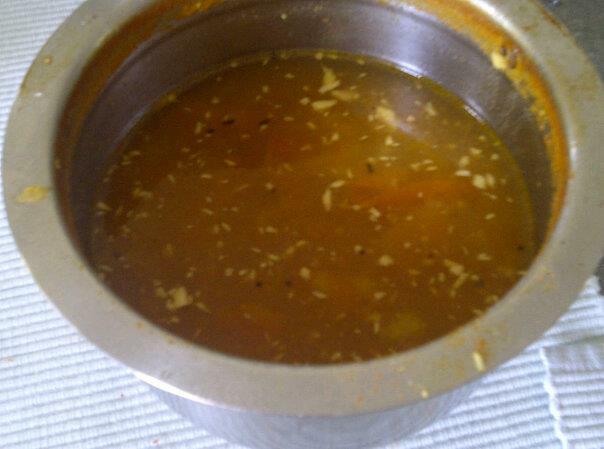 A piping hot Rasam draws people to the dining table spreading so much of fragrance. In financial terms, it can be likened with the #Facebook IPO. If your tradition demands that you should not eat during a solar eclipse, just gulp a glass of rasam and satiate your hunger. I intended to post this to leave my mark in the world even if I die tomorrow. Had #Luke Pomersbach consumed our 'Rasam', he wouldn't have given scope for a complaint of molestation by an American woman. #Shah Rukh Khan alias #SRK consumed this Rasam, he would have not attracted a ban for five years from Wankhede Stadium. Take 500ml of water, tomato pieces and tamarind pulp, let it boil 10 minutes. Add salt and turmeric powder, boiled red gram (dal), finely chopped onions. Add mashed garlic flakes, and jaggery allow it to boil for five minutes. Allow it to boil for five more minutes and add grated coconut and before taking it off the stove. Heat oil in a pan, add mustard seeds, cumin seeds and fenugreek seeds. Allow them to splutter and add asafoetida. Add this seasoing to the above rasam. Add curry leaves and coriander leaves also. Serve south Indian rasam with hot piping rice or serv this as an appetizer. For more Rasam varieties click here.Thank you for visiting my blog. Hope you liked all my recipes. Any feedback and comments are appreciated. please note that in 'charu (Telugu) ' there is no onion.